New Page Books, 9781601633491, 192pp. Author Lisa Barnett has gathered all her most successful techniques, strategies, shortcuts, and wisdom into this one book so you can do it yourself--anytime, anywhere. "I've been working with the Akashic Records for many years and I've found that The Infinite Wisdom of the Akashic Records is the most clear and comprehensive book I've ever seen on how to access the Records and then effectively utilize the knowledge you uncover. Lisa Barnett is a powerful writer as well as, in my humble opinion, a pure catalyst to the Masters of the Records. If you're looking for a way to find your life path, clear old karma, or heal physical, emotional, and spiritual issues, the Records will give you all the answers you're seeking and The Infinite Wisdom of the Akashic Records will gracefully open the door to the Records." --Debra Halperin Poneman, best-selling Chicken Soup author and Founder & CEO of Yes to Success, Inc.
"Wouldn't you love direct access to the library of YOUR soul, the Akashic Record? Lisa Barnett provides you with the key to that access in her new book. Her approach is loving AND practical. She reminds us that how we think, feel and act NOW is within our control, and that our fears and worries reside in the past. Give yourself the gift of pure empowerment by reading this book and applying its wisdom in your life. Your expansion awaits!" "Lisa Barnett is a profound teacher who has taken the wisdom of the Akashic Field and put it into practical lessons so that people can heal their emotional, physical, spiritual, and relationship issues. 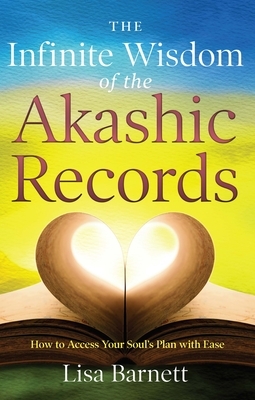 The Infinite Wisdom of the Akashic Records also gives readers insight into their personal Record that previously was available only in Lisa's classes. This book is true gift to anyone looking for support in living their passion!" "Whether you are just learning about the records or have worked with them extensively, [this book] will help you reach new understanding about the power of accessing your personal Akashic Record." "This is a fabulous book, a wonderful service to all readers."